Volkswagen Up 1.0 60 PS review | What Car? What is it? 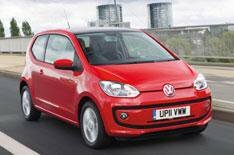 The Volkswagen Up is Volkswagens answer to city cars such as the Hyundai i10 and Fiats forthcoming Panda. It sits on a new platform and will initially be sold with two new three-cylinder 1.0-litre petrol engines. Weve already tested it in 74bhp form, but here were concentrating on the more affordable, 59bhp model. What's it like to drive? Unsurprisingly, the Up is most at home in the city, where its 59bhp engine feels more than capable. The car's compact dimensions and responsive steering make it agile enough to handle corners and mini roundabouts with ease, and it isnt troubled by low-speed potholes. Sadly, the 59bhp engine feels short of pace on the open road - overtaking is laboured and best avoided unless you have a good run up. The sluggish performance also results in frustratingly frequent gearchanges to keep up with traffic. Higher speeds make for an increasingly rocky ride over poor surfaces, too. What's it like inside? The cabin is surprisingly spacious for such a small car it comfortably fits four adults and boot space is class-leading. It's reasonably well equipped for a car in this segment, with air-conditioning and electric front windows. There are some neat labour-saving features, too, such as the variable-height boot floor. The interior is basic but elegant, and its practical the instrument cluster is refreshingly sparse and everything is within easy reach. The build quality is worthy of the VW badge, although the odd detail feels a bit unfinished, such as the central storage compartment in the front, which would benefit from a cover. There's also no vanity mirror on the drivers side. Should I buy one? If you do most of your driving in town, this Up has enough power. The 74bhp model will cost you as much as 2395 more (its available only in range-topping High Up trim), which we think is an unnecessary expense, unless you plan to make frequent motorway journeys.